Yesterday we looked at teaching your kids about kindness, and activities that you can do to reinforce the concept. But what about adults? Our self-centered citizen population is sorely lacking in kindness (and empathy) in 2016. So, is there something adults could read, watch, or listen to, to help them become aware of the unkindness that is prevalent? In our crazy world, kindness seems to have taken a back seat to narcissism, a sense of entitlement, a longing for power, and greed. All you need do is follow the current 2016 political scene. While the kids are home this summer, make it a point to bring kindness into their lives. Come September, educators will bless you! So what's involved? Being a model for your kids by showing kindness to them and others. If you look online there are plenty of resources. I'd recommend starting with "55+ Kindness Activities for Kids." Not only do you get the 55 activity suggestions, but you also get links to more than 55 other bloggers' posts about kindness activities! One of the more difficult aspects of talking about kindness, is getting children to understand what UN-kindness can do to an individual. Here's an article that made the rounds of Facebook a few weeks ago. I think the lesson it teaches is simple and easily understood. A most positive reaction to harassment comes from a young woman scientist, Emily Temple-Wood. Temple-Wood is studying biology at Loyola University and is often the recipient of inappropriate and threatening emails simply because she is a woman in the field of science--once a field dominated by men. What she has done in response is to create Wikipedia entries for women scientists. Read about this admirable undertaking here. It seems that octopuses have become "hot." I've seen more articles and mentions of the sea creature in the past year than I have in my entire life up to this point. What I've learned about them is amazing. Most of what I've discovered has come from a book written by New Hampshire's own Sy Montgomery, The Soul of an Octopus: A Surprising Exploration into the Wonder of Consciousness [594.56 MON, also AB/CD 594.56 MON]. 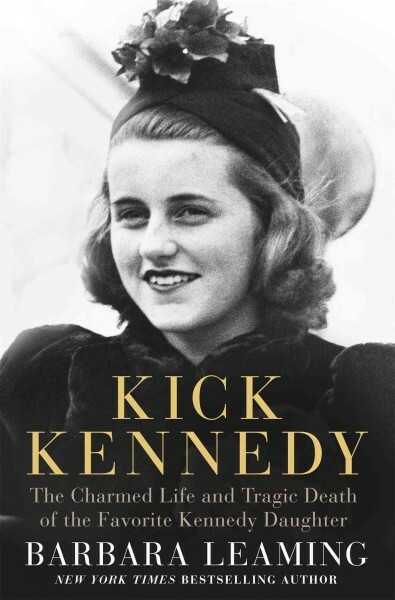 The book was a finalist for the National Book Award for Nonfiction in 2015. It is well-written, interesting, and challenged me to think about how humans think about animals--not surprisingly, we are way off base about their intelligence and capabilities. Since I work during the day, I don't tune into "Science Friday" on NPR, so I missed learning about "Cephalopod Week 2016," which took place last month. Through friends on Facebook, I was alerted to the fact that octopuses are, as I said before, "hot." Hot enough for a whole week to be devoted to them on the radio! Poet John Ciardi was born on this day in 1916. He died in 1986, three months shy of his 70th birthday. 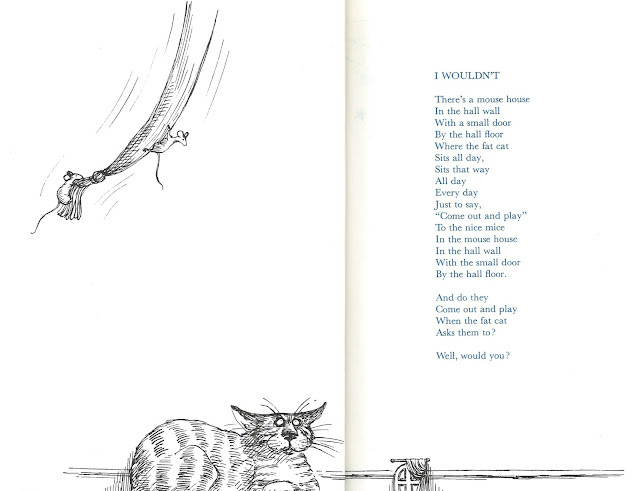 Ciardi capably wrote for both adults and children. On our adult shelves you'll find The Collected Poems of John Ciardi [811 CIA], a weighty tome at 618 pages, and in our children's section, You Read to Me, I'll Read to You [J 811 CIA] (illustrated by Edward Gorey). You Read to Me was originally published in 1962, but we obtained our copy in 1994. It shows little wear, which is surprising since Ciardi's poems are so very similiar to Shel Silverstein's work. You'll find them a little bit unsettling, a little bit naughty, a little bit truthful, with a whole lot of word play--just right for kids! The second I'm posting with the Edward Gorey illustration that accompanies it. Gorey was the perfect choice of illustrator for this book! Happy Birthday, Mr. Ciardi! The poetry celebration continues at Random Noodling where you'll find more Ciardi as well as this week's Poetry Friday Round-Up. On Your Mark, Get Set...READ! This year the theme of our summer reading program encourages children to read and to keep active. Sports will play center stage in our events, and kids will have the opportunity to learn how to play lacrosse, flag football, frisbee, and volleyball. There will be a basketball trick demo, and yoga, too! In addition to the sports activities we'll also have a puppet show, balloon twisting, family trivia, LEGO fun, and a Museum of Science rocket program! It all begins today at 1:00 pm with sign-ups for reading. Raffles, crafts, and edible treats will be part of the fun. The Friends of the Library of Windham FLOW, is sponsoring a high-energy juggling act by Jason Tardy at 2:15 pm. The summer kick-off party is for children of all ages. And, if you can't make it to today's party, reader registration will continue throughout the summer. If, after you watch today's performance, you find yourself wanting to learn juggling, here's where you can start: Juggling by Elizabeth Dana Jaffe [J 793.8 JAF] and The Usborne Book of Juggling by Clive Gifford [J 793.8 GIF]. With the rise of the pharmaceutical industry in the United States we have lost, or learned to distrust, our awareness of the medicinal properties of plants. It remains to be seen if this has been a wise move on our part. Other creatures, oblivious to the effects of advertising, continue to enjoy the benefits of natural healing. A most amazing article, "Self Medication, Wildlife Style: How Birds and Other Creatures Use Medicinal Plants" can be found here. It may make you realize how very uneducated we humans are about the natural world! Discover more about medicinal plants and natural healing at the Library! 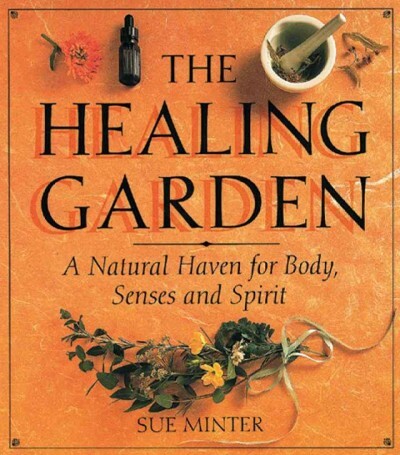 You can start with Sue Minter's The Healing Garden: A Natural Haven for Body, Senses, and Spirit [615 MIN], then move into Rosemary Gladstar's Medicinal Herbs: A Beginner's Guide 33 Healing Herbs to Know, Grow, and Use [eBook]. And don't forget to go outside and smell the flowers! Once school is out, parents are presented with the problem of "what to do with the kids?" Besides the obvious READ! and visit the Library for reading, viewing, and listening materials and events, what else is there to do? Browse through this list of "100 Outdoor Adventures to Do Before Your Kids Turn 10." This list is not full of new and unusual adventures that will cost you tons of money, but it contains activities that may seem totally obvious. The trouble with something that should be "obvious" is that, it may be so familiar as to be overlooked. Why not try #10, "Jump in a lake," but do it locally at the Windham Town Beach at Cobbett's Pond. Lake swimming doesn't have to be turned into a big production involving car rides to lakes in Massachusetts or Maine or an hour and a half's drive north in New Hampshire. Say you're up for a daytrip, there are plenty of places here in NH and the rest of the New England states, that don't require an overnight stay. Visit our Pinterest page, "Travel Close to Home," where we've collected 145 locations and activities that are not too far away! If you've found a place that's close to home and is not on our Pinterest page, let me know here. If there's a website I'll find it and pin it to our board! Oxford Dictionaries annually pick a "Word of the Year." The standard "Word of the Year," announced last November wasn't even a word at all--it's an emoji! 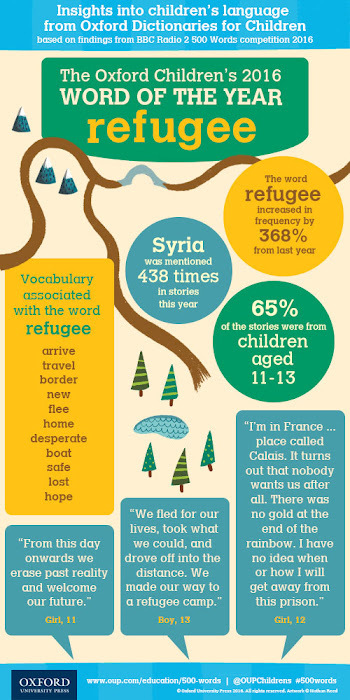 The "Children's Word of the Year" is "refugee." What better day to feature it than today--World Refugee Day! The United Nations has designated every June 20 to be World Refugee Day. It is interesting to me that the word refugee was picked because of the frequency in which it appears in children's stories submitted to a BBC Radio contest. The word's use increased 368% from 2015! That means refugees and refugees' struggles affect children deeply. Children have a strong sense of justice, so these must be trying times for refugee children and their native friends. The Library is in the midst of a "secret" outdoor project--details forthcoming. 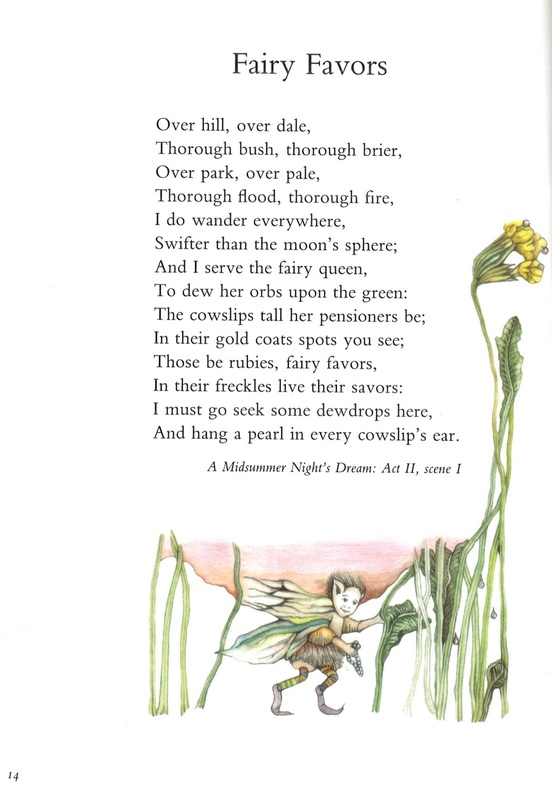 Let's just say the fairy poem for today is a hint of what's in store! Flitter on over to Carol's Corner for this week's Poetry Friday Round-Up. On display are a continuously changing selection of books on crafting. (Changing because the books are being borrowed--yay!) The finished projects are ones created by staff, in some cases using instructions found in the books. On our shelves you'll find even more crafting books for all ages! There's a woman in Australia, named Loongkoonan, who is 105. She began to paint her fabulously detailed works in her 90s. Read about her here. 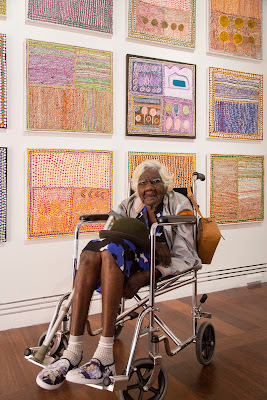 Image courtesy Art Gallery of South Australia, Adelaide. So what are you waiting for? Now's the time to begin being creative! You can write, do art, knit, design a butterfly garden, write a song, take tap lessons, etc. Julia Cameron has a new book, It's Never Too Late to Begin Again: Discovering Creativity and Meaning at Midlife and Beyond [eBook] to help you on your way! The lazy days of summer are approaching and perhaps you'll have time to catch up on your reading AND your movie watching. : any of various small images, symbols, or icons used in text fields in electronic communication (as in text messages, e-mail, and social media) to express the emotional attitude of the writer, convey information succinctly, communicate a message playfully without using words, etc. 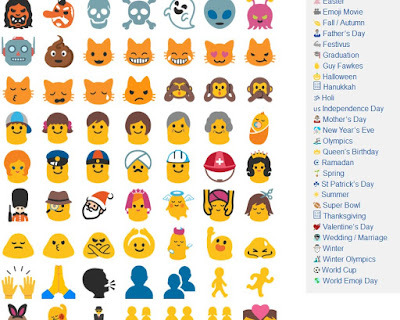 I was late in getting this post together, so, I'm going to take this opportunity to introduce you to something called the Emojipedia. 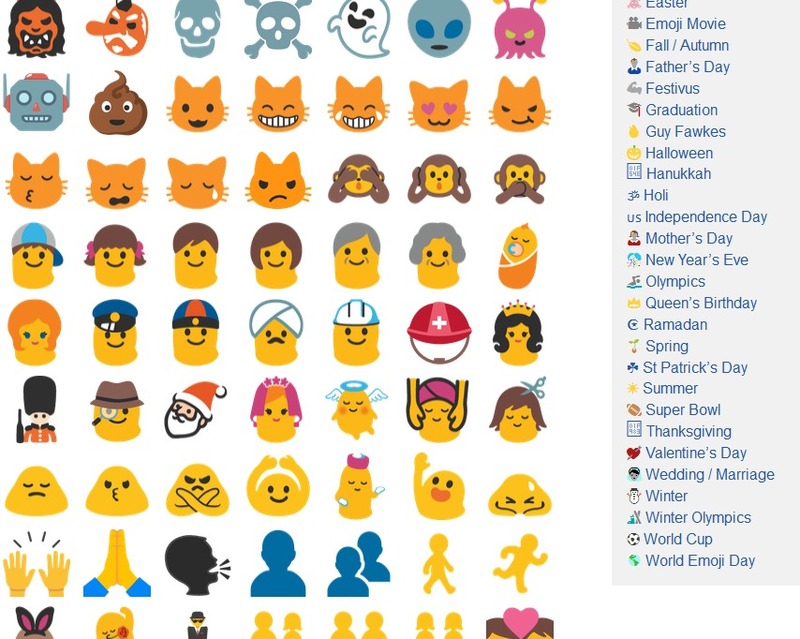 If you, like me, have a hard time trying to figure out the tiny icons, called emojis, that friends, relatives, co-workers send in their text messages, the Emojipedia, might be a way to unravel the mystery of texting! You can look things up by platform, for example, what you can use on Facebook or Twitter. Or, you can look things up by category, for example, if you and a friend have a sushi date, you might want to add a sushi icon to your text message. Check under the "Food & Drink" category to find sushi. Spice up your messages, but don't get carried away! I love the word choice--"Purpose in liquidity," "wetter water, slimier slime," "Squamous, omnipotent, and kind" "Paradisal grubs." Today's Poetry Friday Round-Up is being hosted by Carol at Beyond Literacy Link--be sure to stop by! On this day in 1891, one of America's greatest popular composers, Cole Porter, was born in Indiana. 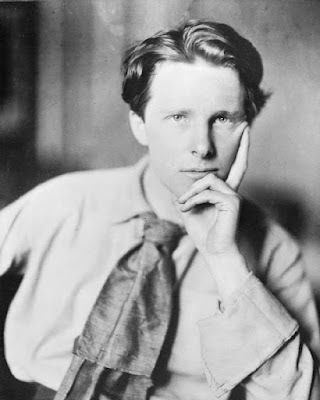 Porter's first song, "The Bobolink Waltz," was published when he was ten years old! Here's a video of Porter singing "You're the Top," from the musical, Anything Goes, and which is now a classic. It's been played, sung, or danced to, hundreds of times since 1934. Many of the "top" people, places, and things, referenced in the song, are no longer part of the popular culture. Wikipedia has an article on the song that lists the items and provides links for more information. An interesting DVD in our collection is Great American Songbook [DVD 781.63 GRE], which covers great American songwriters of the 1930-1950 period such as Porter, George and Ira Gershwin, and Irving Berlin. The plant’s clear, watery sap works with moisture and sunlight in a reaction called phytophotodermatitis. People coming into contact with the sap develop large, painful blisters that resemble severe sunburn. Some have had to be hospitalized for intravenous antibiotics and cortisone injections and have taken a month or more to heal. 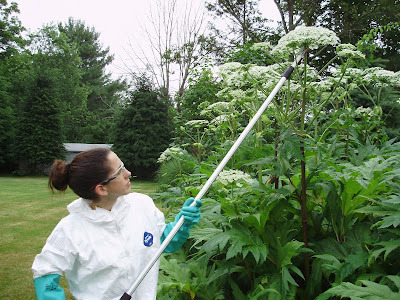 The USDA lists giant hogweed as a "Federal Noxious Weed, and the state of New Hampshire lists it as one of the "Prohibited Invasive Species." See photos here. NH residents who suspect they have found giant hogweed should call the Cooperative Extension’s Family, Home & Garden Education Center’s Info Line at 1-877-398-4769, Monday-Friday, 9:00 am -2:00 pm, prepared to describe the plant and its location. People who have already made a positive identification should notify Doug Cygan at 271-3488. Since 1851, more than 200,000 people have been the subjects of obituaries in The New York Times. Join us this summer as we revisit many of these memorable lives. Memorable lives--there are many ways to interpret a "memorable" life. For some it would be a life of service to others. For others it would be a great political or military leader. Still others are memorable for the adversity they had to overcome. And then there's the 21st. century edition of memorable--someone who has made a name for him or herself through social media! Here at the Library, we have biographies of all kinds of memorable people! Egan, Timothy. The Immortal Irishman: The Irish Revolutionary Who Became an American Hero. [B MEA, AB/CD B MEA, eBook] About Thomas Francis Meagher. 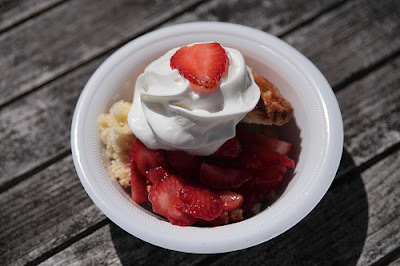 On Sunday, from 11 to 4 at Windham High School, the Friends of the Library of Windham (FLOW) are holding their annual Strawberry Festival and Book Sale. Every year, on the Friday before, I try to find a strawberry poem to share. After several years, my pile of strawberry poems (those with at least a mention of strawberries) is getting smaller and smaller. This year, the poem I'm sharing was written during World War I. It is an anti-war poem from 1918 by Margaret Postgate Cole. Ever be young again, be young again? O cakes, O cakes, O cakes, from Fuller's! Plotting in an afternoon the new curves for the world. For mining the coal for the great armies. And sap making the warm air sweet. Though you planted it out on the hill again it would be dead. In Sheer, underneath the larches? Pretty grim for a "strawberry" poem. Never mind, FLOW will have lots of HAPPY strawberry shortcake on Sunday. Stop by! And stop by Check It Out, for this week's round-up of great poetry links. It's FLOW Strawberry Festival and Book Sale Time! Today, in our Multipurpose Room, you'll find books, puzzles, CDs, DVDs, and more at the Book Sale. The sale runs today from 9:00 AM to 6:00 PM, and tomorrow 9:00 AM to noon. Remaining materials will be moved to WHS as part of the Strawberry Festival. It's a great opportunity to stock up on summer reading materials and to support the Nesmith Library! Talk about win-win! Today is the first day of June, and the beginning of Great Outdoors Month! The weather has certainly started cooperating! If you can't get out the rest of the month, please make an effort to get out on Saturday, June 11, which is designated as National Get Outdoors Day. The National Park Service is celebrating its 100th anniversary this year, and lots of events are planned at parks throughout the United States. 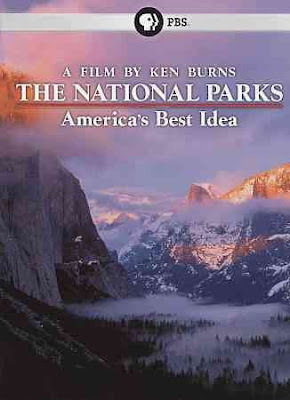 To find the national parks in New Hampshire or in any of the other states, click here. What do you like to do outdoors? Fish?--look in our 799 sections. Hik?--796.5. Sketch?--741.2. Learn more about what nature has to offer?--508 or 574. Camp?--796.5. Spread a blanket on a sandy beach and read? 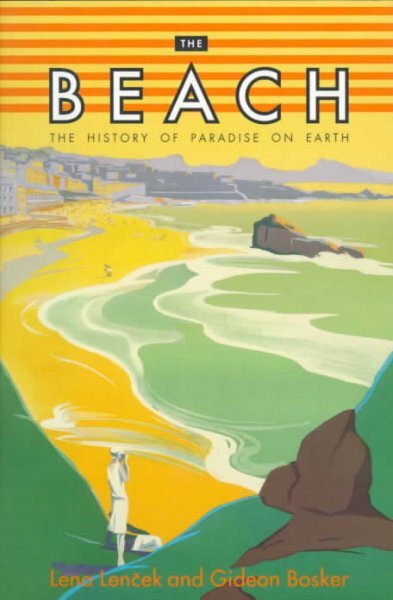 You might find Lena Lenček's The Beach: The History of Paradise on Earth [394 LEN] the perfect book to take along with you! Whatever you like to do, I'm sure you'll find something at the Nesmith Library to help you do it better or smarter or easier or find a place to do it!